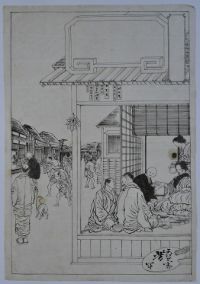 An original oban drawing by Yoshitoshi (an hanshita-e). 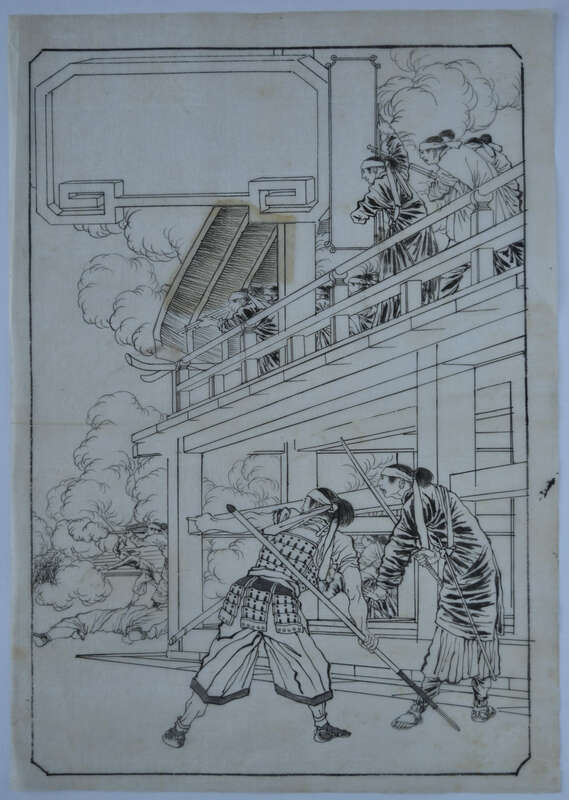 A design for an unpublished set, probably showing an episode in the Satsuma Rebellion where a group of disenfranchised samurai rebelled. Probably executed c. 1877. Fine condition. One area of pentimenti. 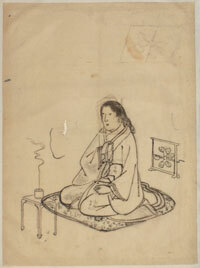 An original preparatory drawing (hanshita-e) for an unpublished set. 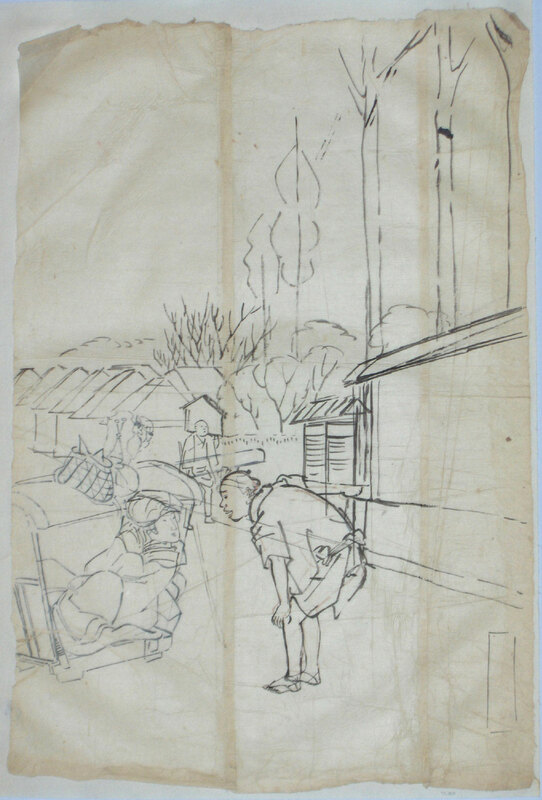 Shows a busy street scene with a doctor’s surgery on the right. Probably c early 1870s. 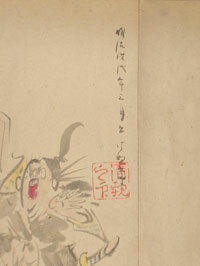 Signed on a painter’s palette Ikkaisai Yoshitoshi fude. Two small areas of pentimenti. 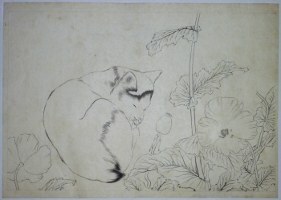 Sumi on thin Japanese paper, image size 13.5 x 9.25 in; 34.5 x 23.5 cms. In good condition. 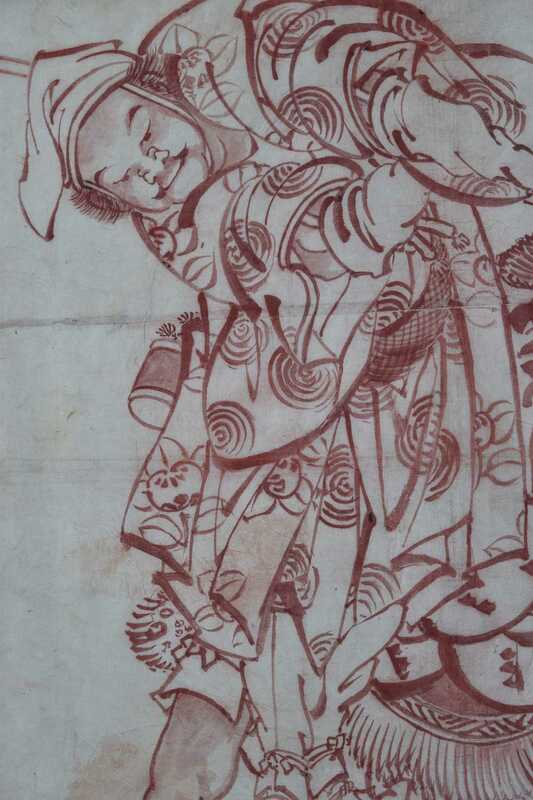 One of Hokusai’s best pupils. 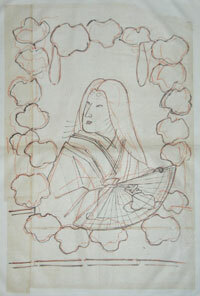 Known for his paintings of beauties but also designed some fine surimono. An original fan painting showing a reclining beauty. 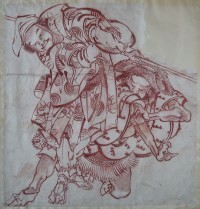 Sumi and light red on silvered paper, 7.25 x 17.75 in; 18.5 x 45.2 cms. 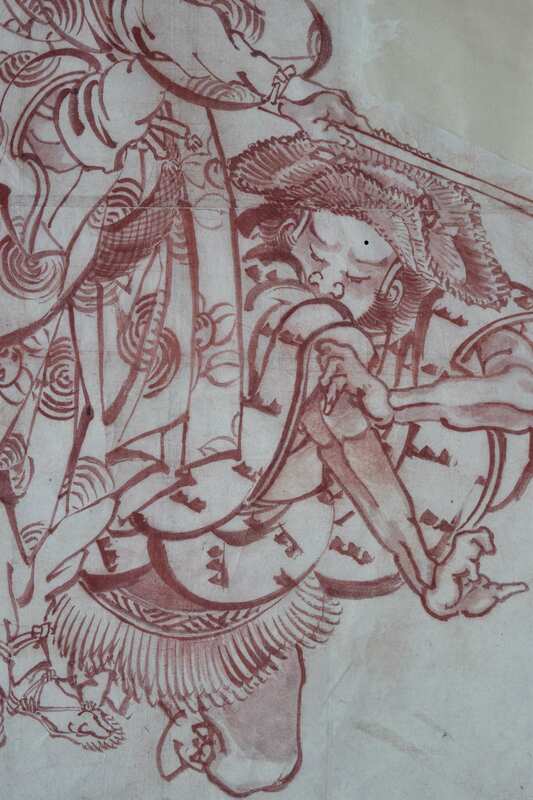 Removed from a fan, so rib folds and other minor marks. 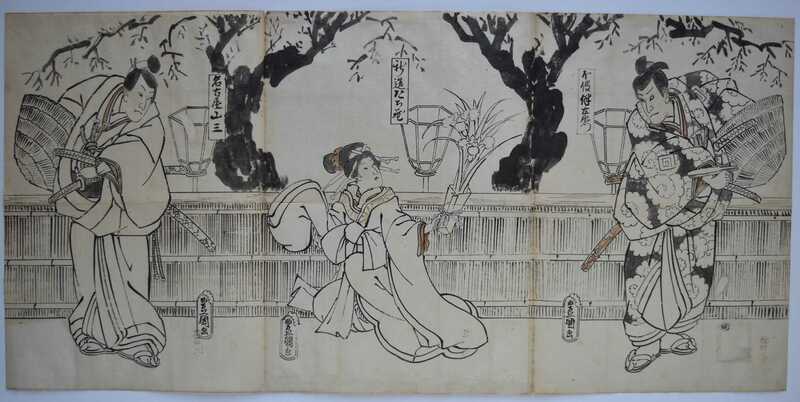 Signed Hokuba ga.
A five-sheet original drawing (hanshita-e) showing a parade of beauties before a wicker fence and blossom. 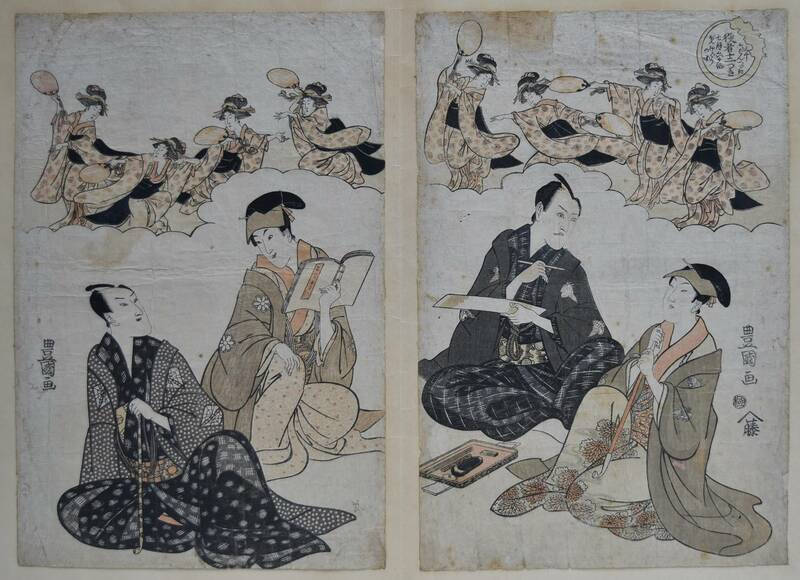 Bigyoku imayo hanazoroi, “An Assortment of Modern Beautiful Gems as Flowers.” Nice brushwork on the sumptuous kimonos. 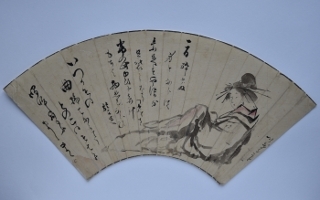 Sumi with sumi wash and light touches of red on thin Japanese paper laid onto further thin Japanese paper. 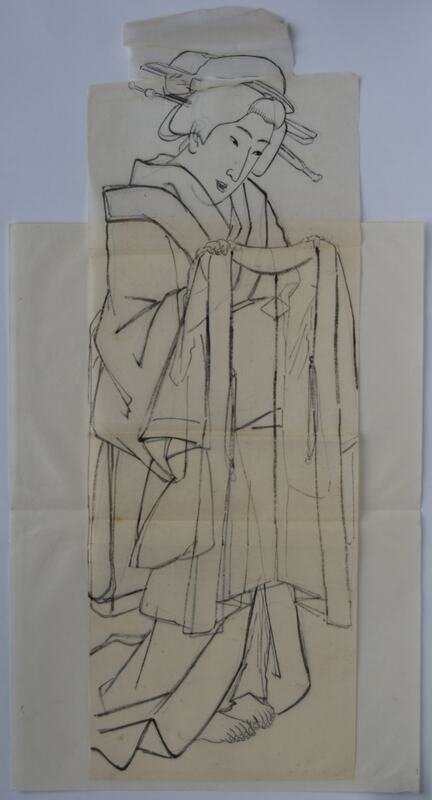 Each sheet signed Ichikawa Yoshikazu ga. Sold “as is” with all imperfections, but in good condition. 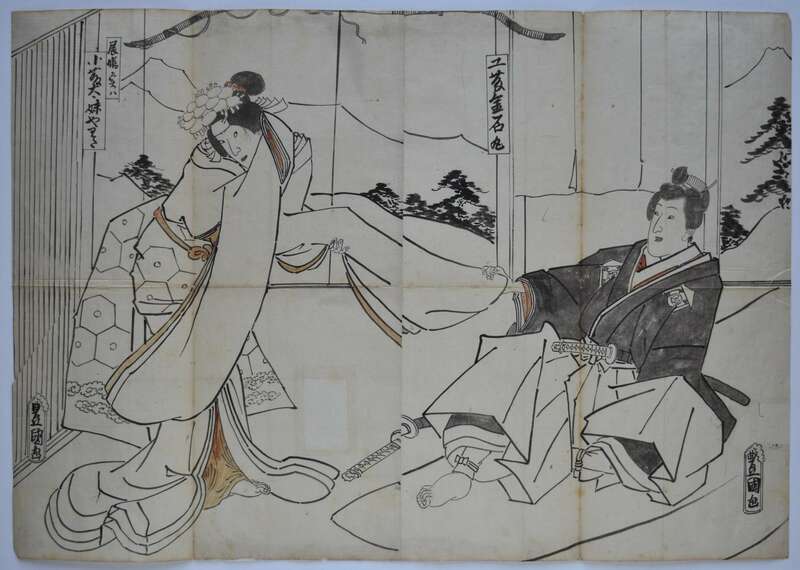 An original hanshita-e (preparatory drawing) for a triptych showing the ground floor interior of a brothel in the Yoshiwara with courtesans and their assistants. 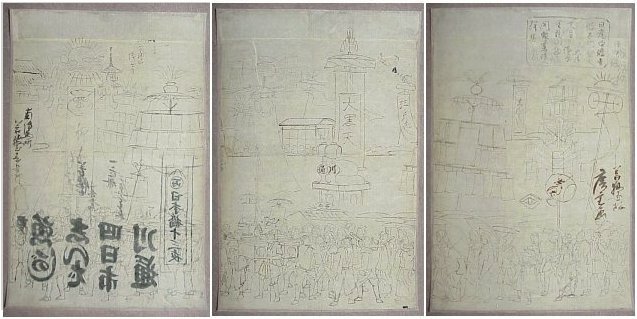 These first drafts by the artist themselves survive because a more detailed drawing was needed by the blockcutter, and this was normally given to an assistant to execute. Or the drawing was never taken up by the publisher, for whatever reason. 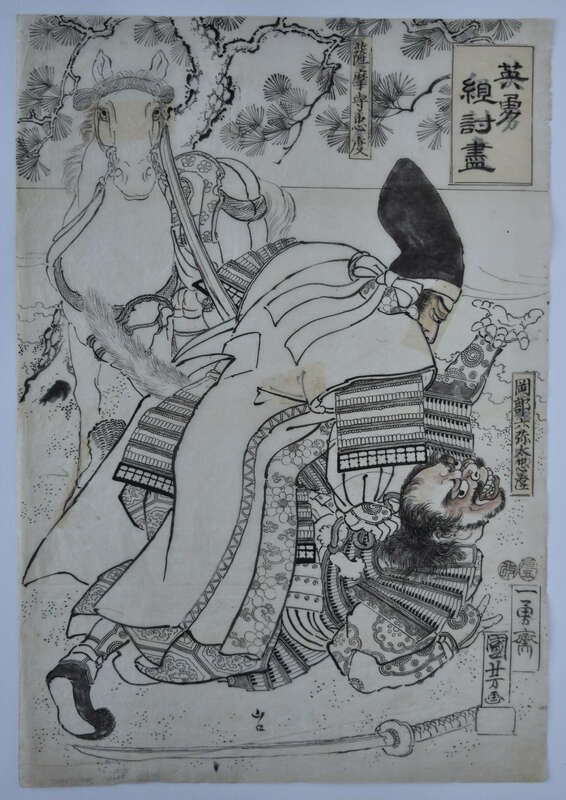 He was a pupil of Kunisada, originally calling himself Sadashige, and becoming Kuniteru when Kunisada became Toyokuni III. Sumi and touches of red. Extensive pentimenti. Sold “as is” with all imperfections. 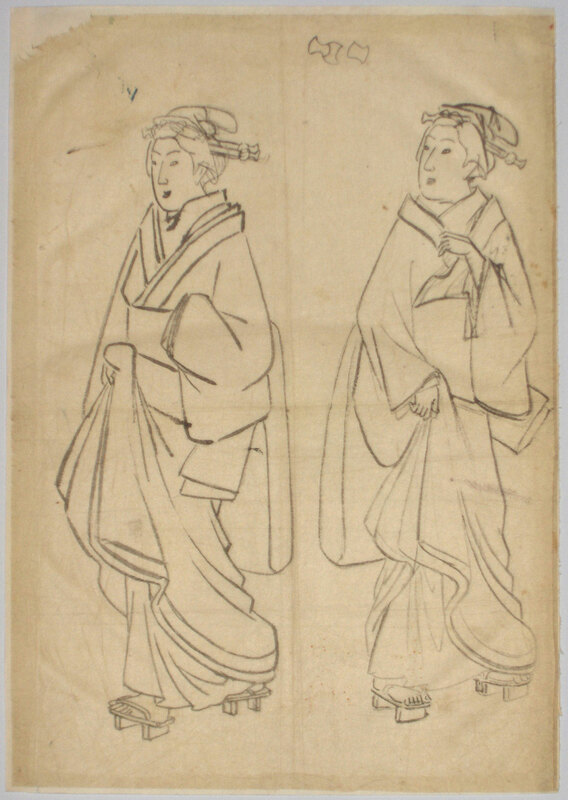 Signed on two sheets Kuniteru ga.
An original drawing by the first Toyokuni. 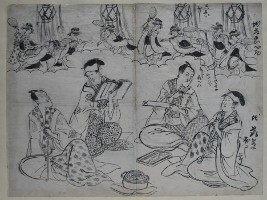 An hanshita-e diptych for a published set of triptychs with title: Yakusha juni tsuki, “Actors in the Twelve Months.” Shows the actors (from the left) Bando Mitsugoro III holding a pipe; Iwai Hanshiro V with an open book; Nakamura Utaemon III about to write a poem; and Segawa Roko IV with another pipe. 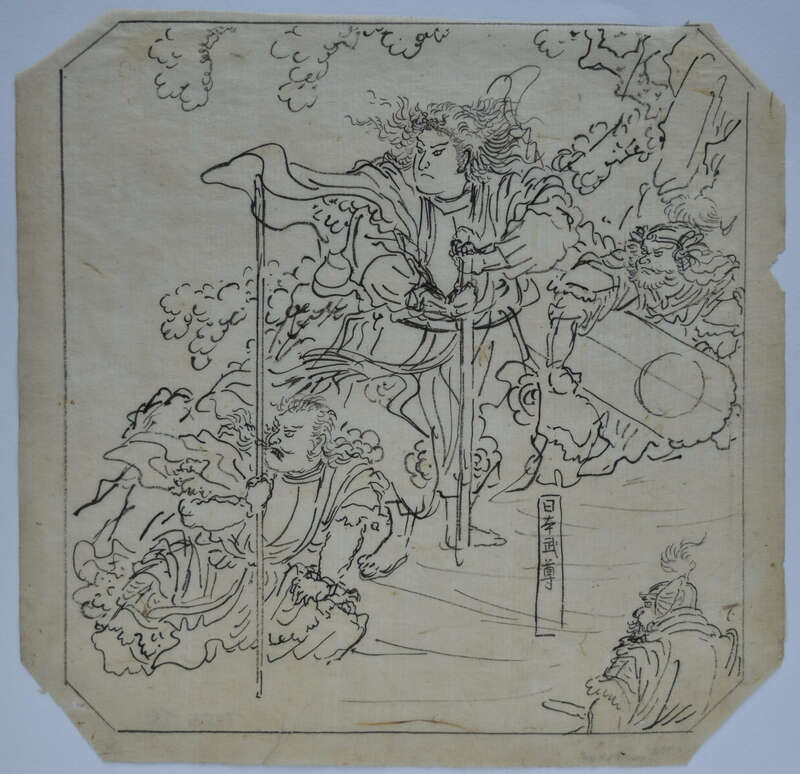 They are compared to the months of the year, in this case July, the month of the Bon Odori festival and are also a parody of the Six Immortal Poets. 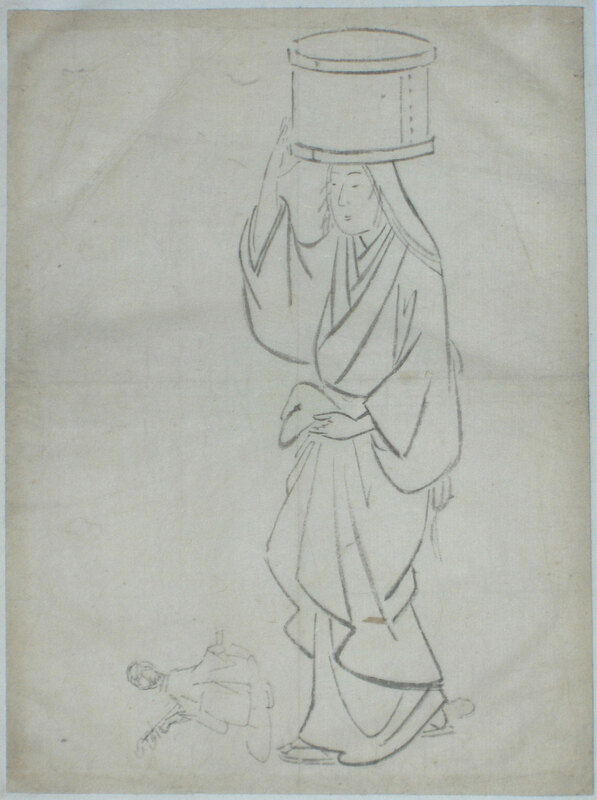 The print published by Yamashiroya Toemon (active c. 1801-1817). 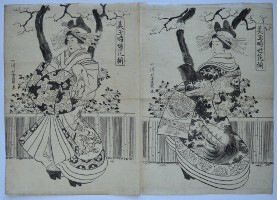 In fact this set was published Spring, Bunka 6 (1809). Sumi on thin paper laid around edges onto another sheet. 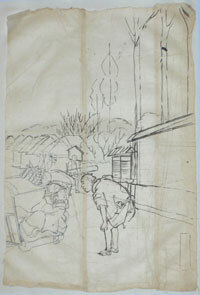 Some pentimenti and also shows the initial hurried under-drawing and with annotations for the finished print. 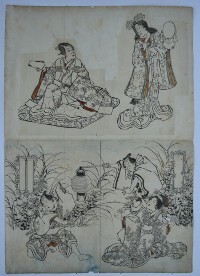 Sold together with the two published sheets which shows the lanterns removed at top, the brazier bottom centre and other minor changes. In indifferent condition. An illustrated example of this complete triptych is in the Austrian Museum of Applied Arts. 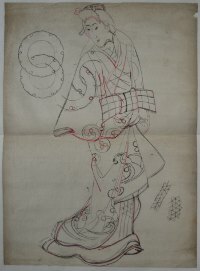 The print signed Toyokuni ga. 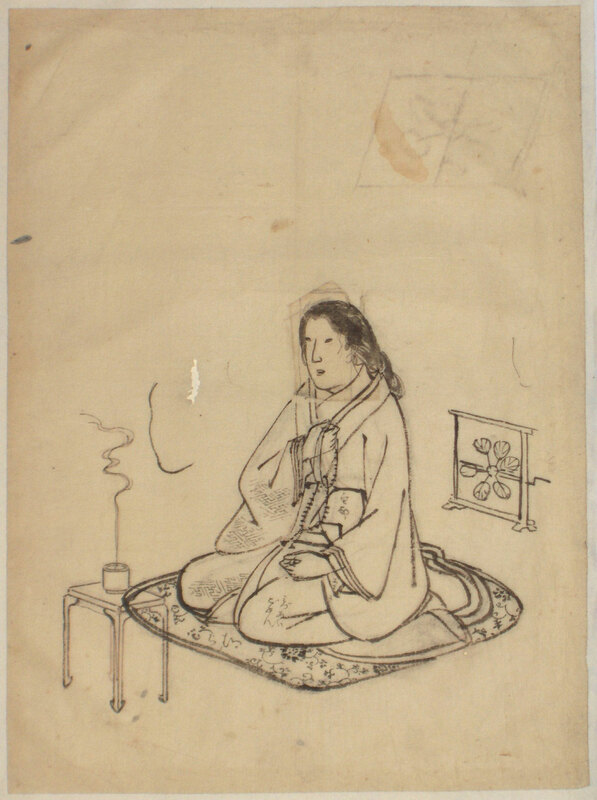 Original hanshita-e by Toyokuni I are extremely rare. Sold “as is” with all imperfections. 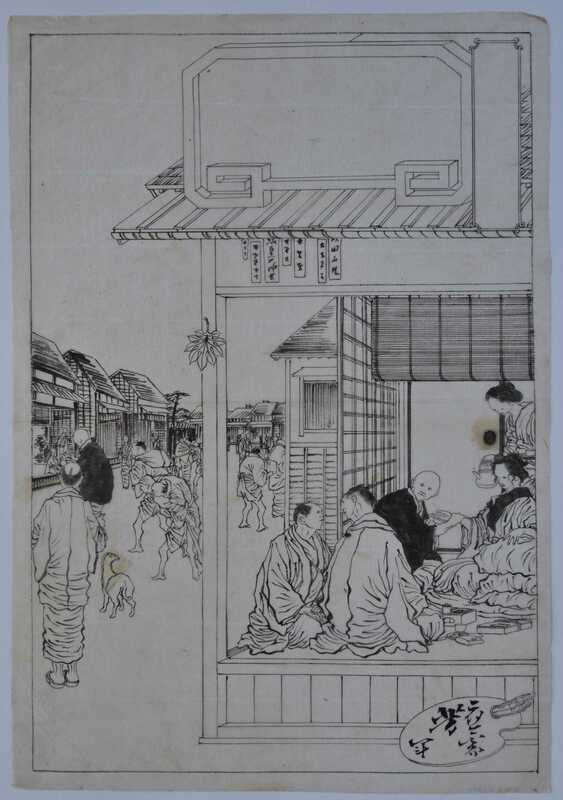 The dates for Unsen are not known but he was working in the early Meiji period. 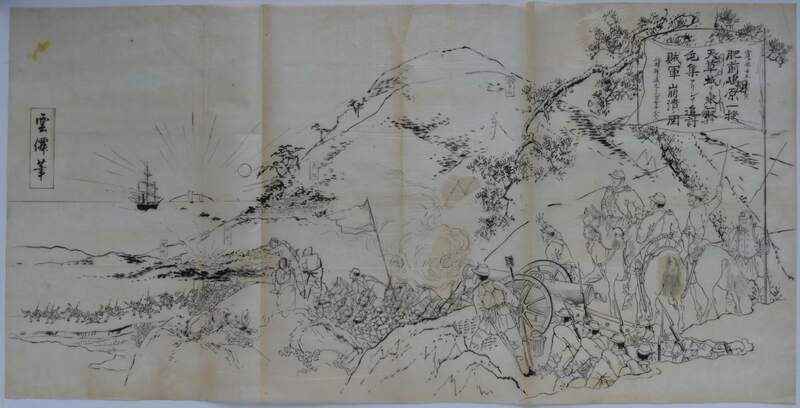 This original hanshita-e shows Imperial troops defeating the rebellion during the Shimabara riot. 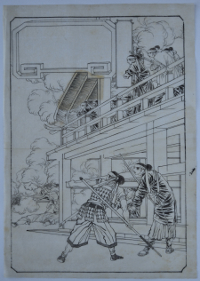 (The events took place in 1637/8 although contemporary uniforms and artillery are shown. Comments on topical subjects were often “masked” by being set in a different period.)) 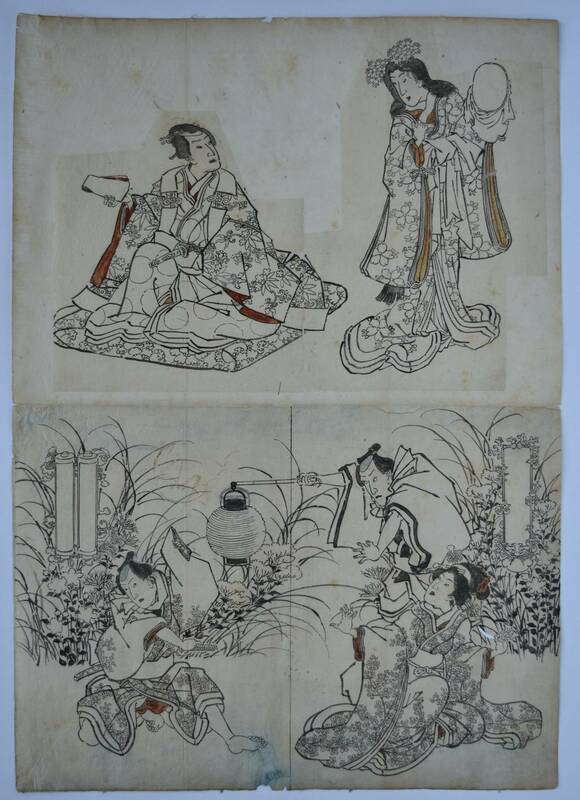 A well drawn triptych in good condition using pentimenti. Signed Unsen hitsu. 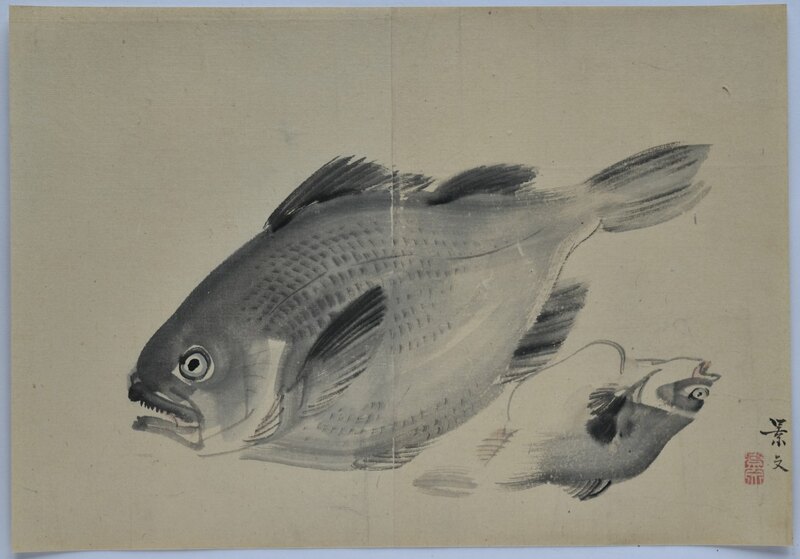 A shijo brush drawing of a seabream and a lumpfish (?). One of Kyoto’s leading artists. Noted for his painting from nature. 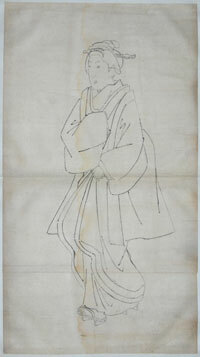 He studied with his older brother Matsumura Goshun as well as Maruyama Okyo. Sumi and light colour on paper, 10 x 14.75 in; 25.4 x 37.4 cms. In good condition. Signed and sealed Keibun. A shijo brush drawing of a white horsehead and an acropomatidae (?). One of Kyoto’s leading artists. Noted for his painting from nature. 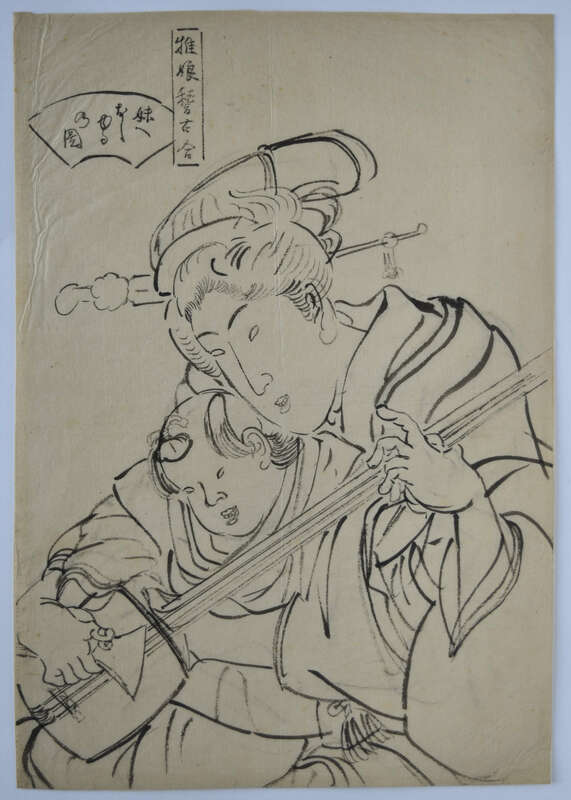 He studied with his older brother Matsumura Goshun as well as Maruyama Okyo. Sumi and light colour on paper, 10.5 x 15 in; 26.7 x 38.1 cms. 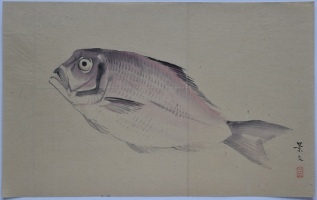 A shijo brush drawing of a red seabream. One of Kyoto’s leading artists. Noted for his paintings from nature. 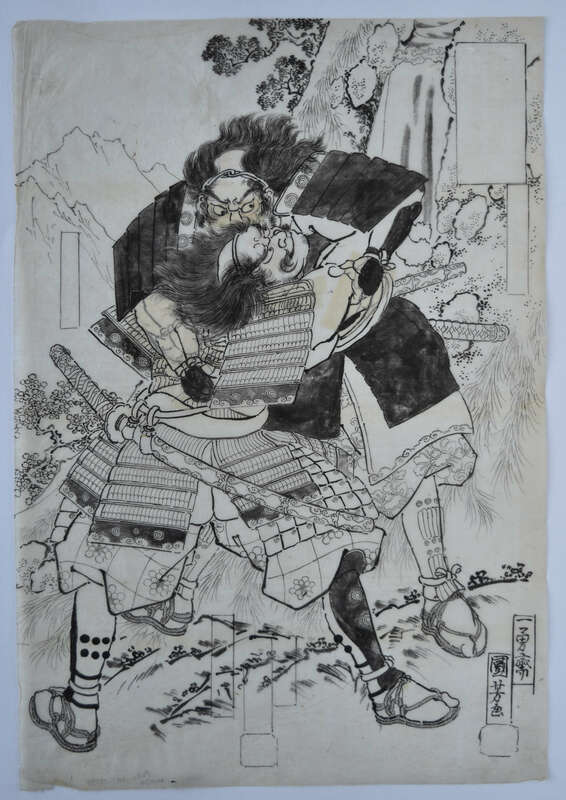 He studied with his older brother Matsumura Goshun as well as Maruyama Okyo. 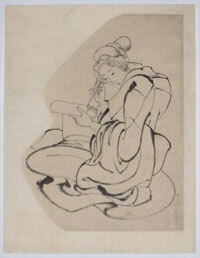 Sumi and light colour on paper, 10.5 x 17 in; 26.7 x 43.2 cms. 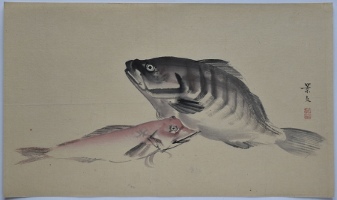 A shijo brush drawing of a gurnard and a snapper (?). One of Kyoto’s leading artists. Noted for his painting from nature. He studied with his older brother Matsumura Goshun as well as Maruyama Okyo. Sumi and light colour on paper, 10.5 x 17.75 in; 26.7 x 45.1 cms. An original drawing showing a beauty with an acolyte. Sumi on thin paper. 14.5 x 10.5 in., 37 x 27.5 cms. 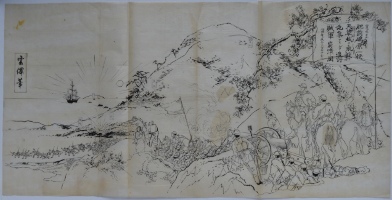 A large original drawing. 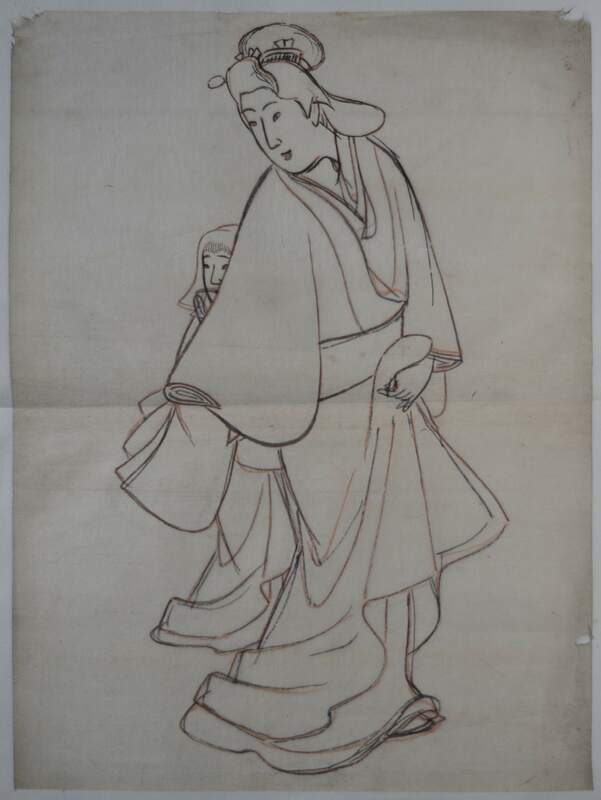 Probably for a kakemono-e. Sumi on thin paper. 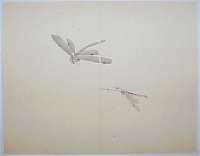 29.5 x 9.75 in., 73 x 24 cms. 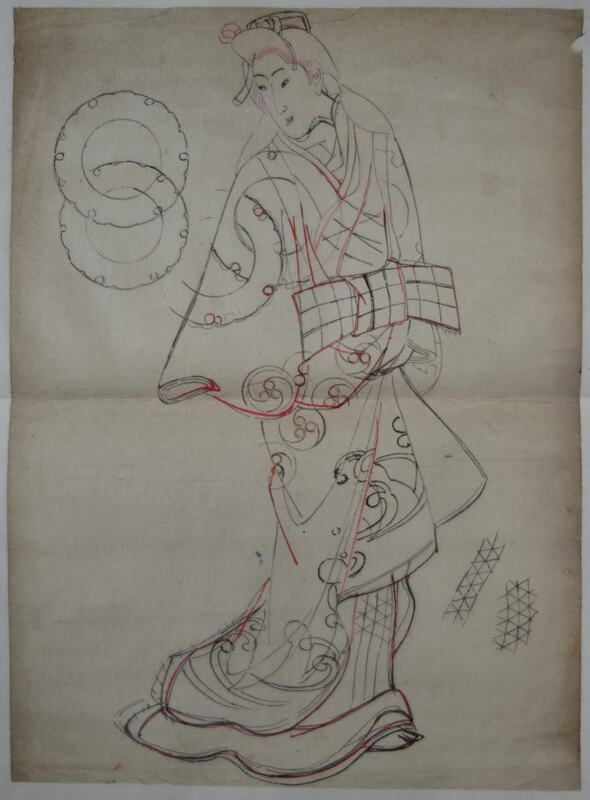 An original drawing showing a full length study of a woman with details of the pattern on her dress. 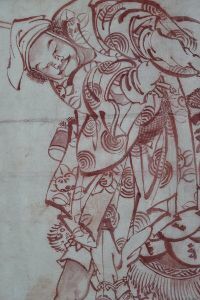 Sumi and red under-drawing on thin paper. 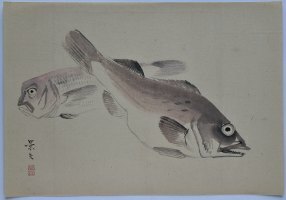 14.75 x 10.75 in., 37.5 x 27.5 cms. 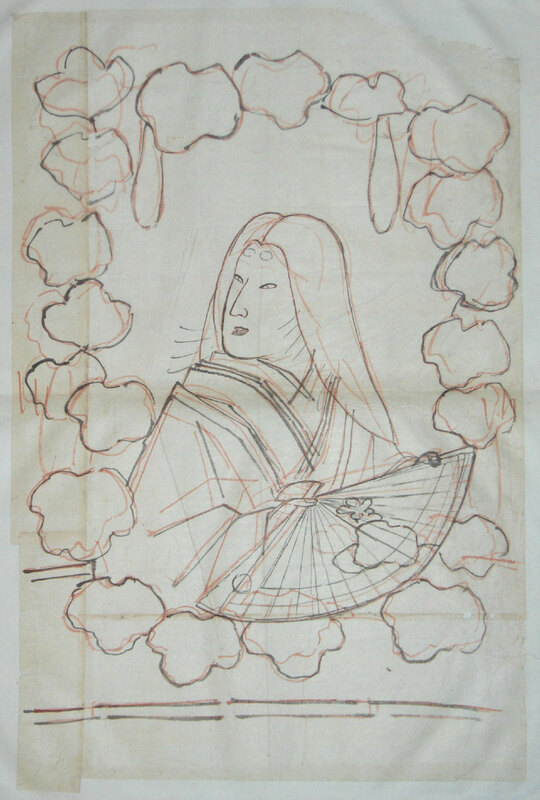 An original drawing showing a bust portrait of a Heian beauty holding a fan with a surrounding motif of gourds and leaves. 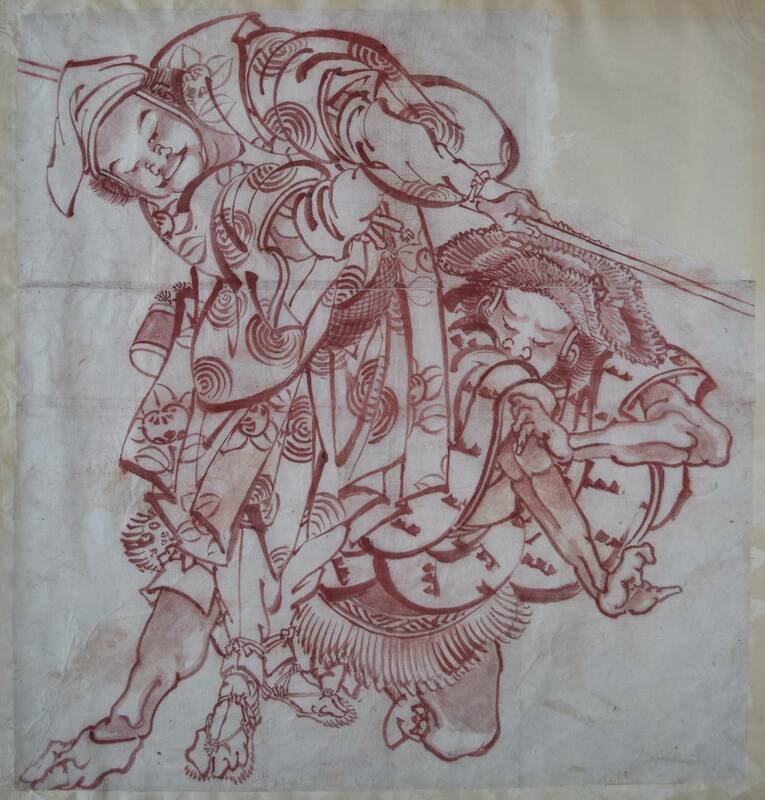 Sumi and red under drawing on thin paper. 18.5 x 12 in., 47 x 31 cms. 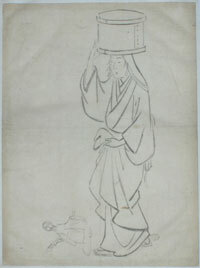 An original drawing showing a full length study of a peasant carrying a box on her head. 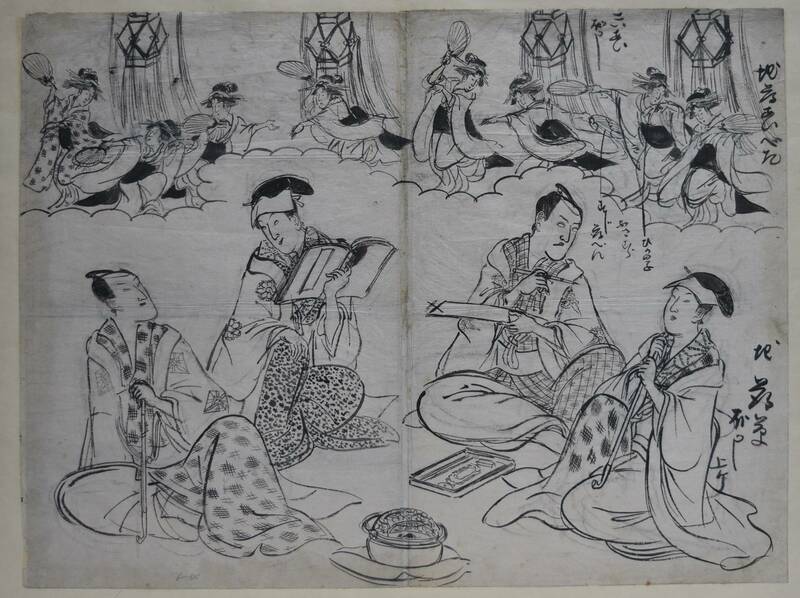 A small vignette of a samisen player at the bottom left. Sumi on thin paper. 12.75 x 9.5 in., 33 x 24 cms. An original drawing showing a study of a seated woman holding a rosary in front of an incense burner. Sumi and pentimenti on thin paper. 13 x 9.5 in., 33 x 24.5 cms. 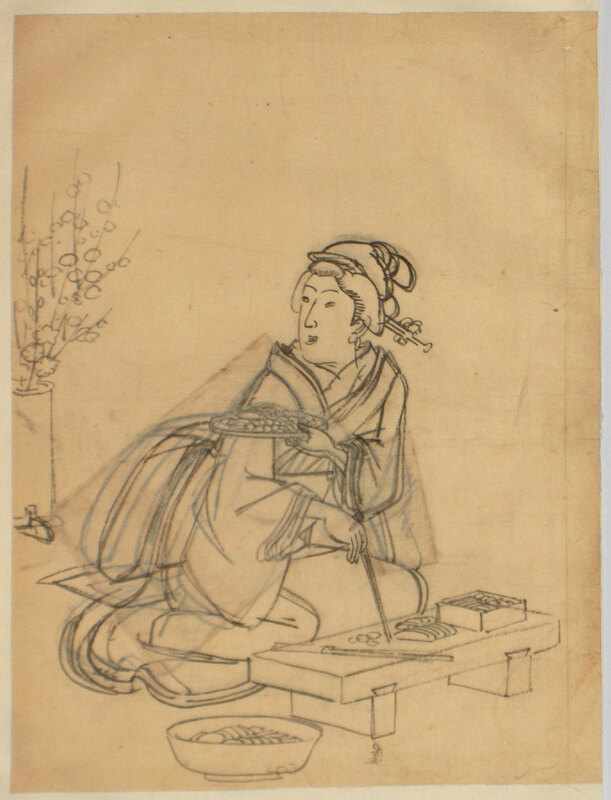 An original drawing showing a seated woman offering sushi on a platter. Sumi and pentimenti on thin paper. 12 x 9 in., 30 x 23 cms. 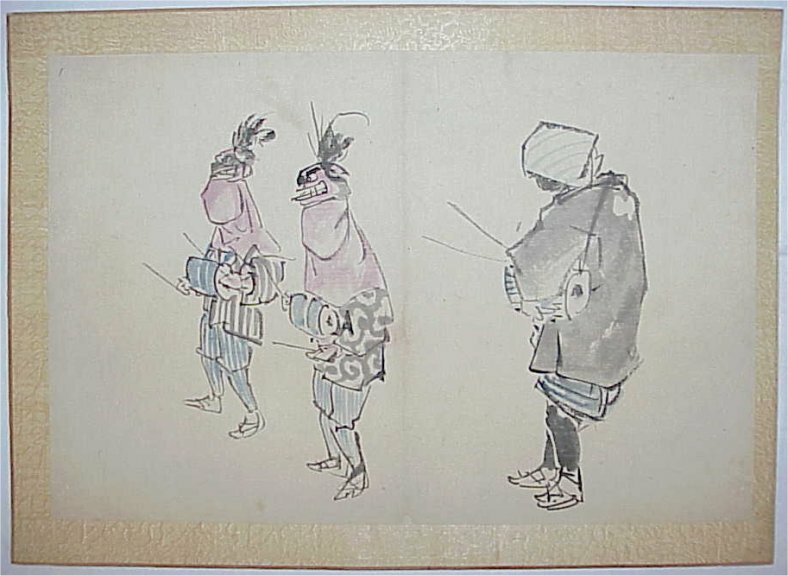 Three New Year drummers; two with lion (shishi) masks. Sumi and colour on paper, lightly laid onto card. 24.2 x 36.2 cms; 9.5 x 14.25 inches. In good condition. Unsigned but from a group, one of which bore full signature. 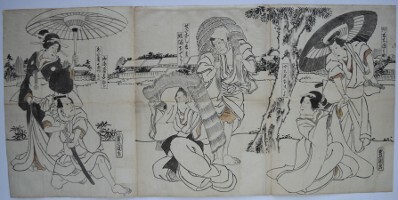 An original drawing showing a village scene with a man bending to speak with a woman in a kago. 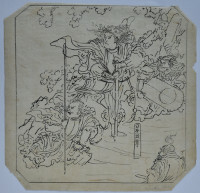 Most likely a design for one sheet of a triptych. Sumi on thin paper. 14 x 9.5 in., 35.5 x 24.5 cms. 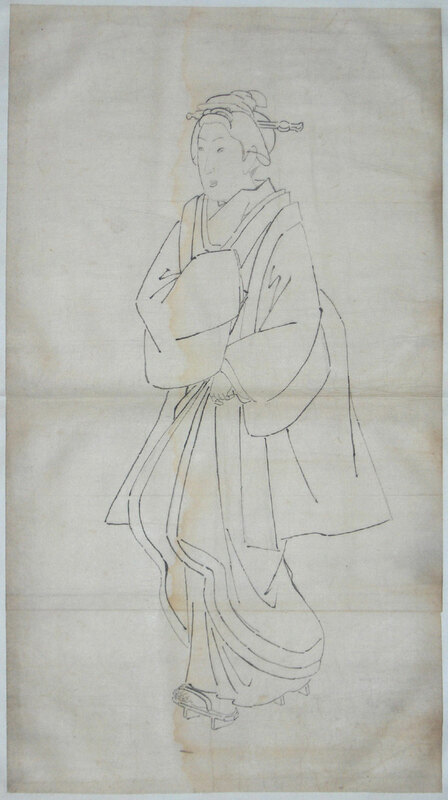 An original drawing showing a full length study of a woman. Sumi on thin paper. 19.5 x 10.5 in., 50 x 27 cms. 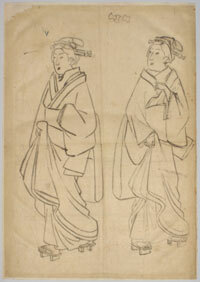 An original drawing showing two full length female studies. Sumi on thin paper. 14.5 x 10 in., 36.5 x 25.5 cms. 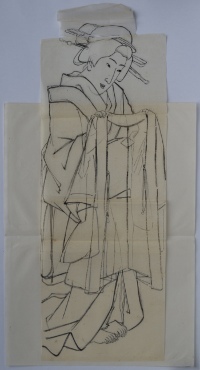 An original drawing showing a full length study of a woman surrounded with various vignettes of the same model. Sumi and pentimenti on thin paper. 14.5 x 10.5 in., 37 x 26.5 cms. An original giga hand-scroll by Kiyochika, sumi and colour on paper, 504 inches x 10.5 inches. Shows the progress of a horseman on observing a beauty and attendant. 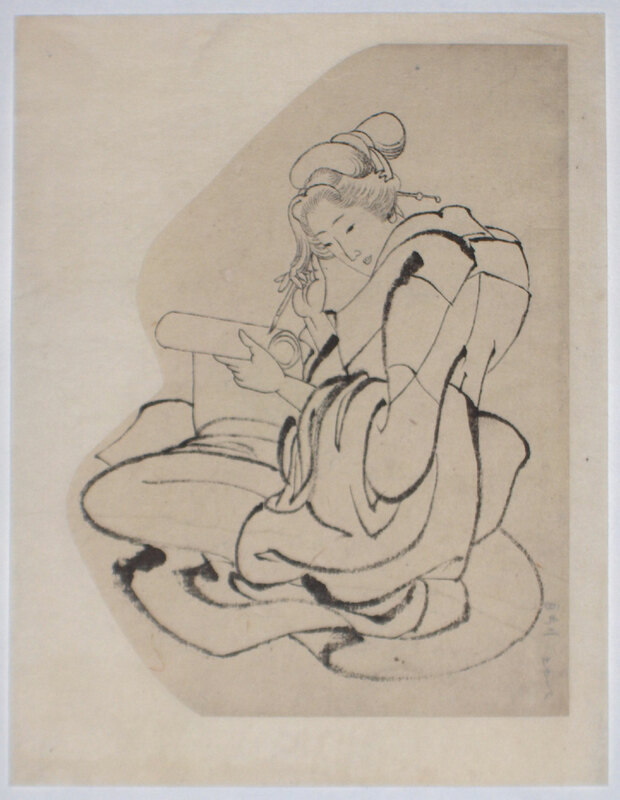 Kiyochika, one of the last great ukiyoe artists, studied oil painting under Charles Wirgman, and ukiyoe painting with Kyosai and Zeshin. 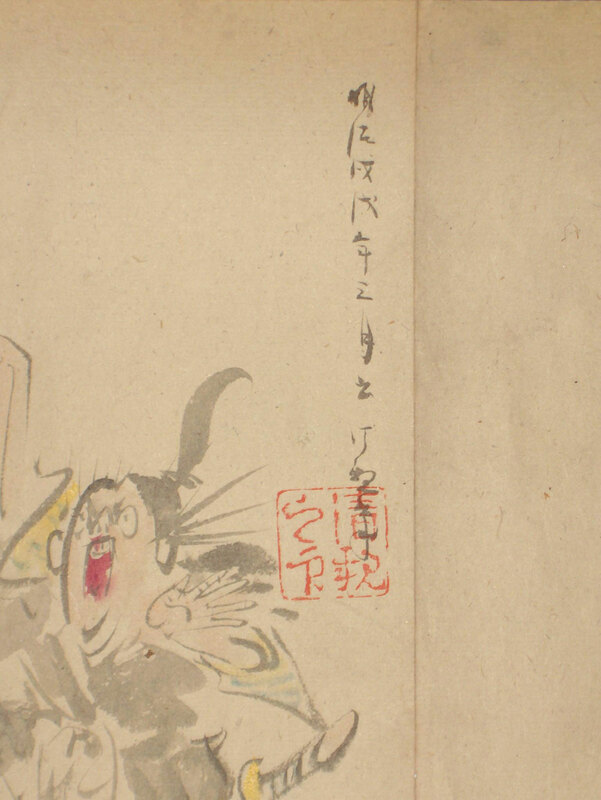 This was probably an orihon ( folding album ) which has been remounted as a hand- scroll. 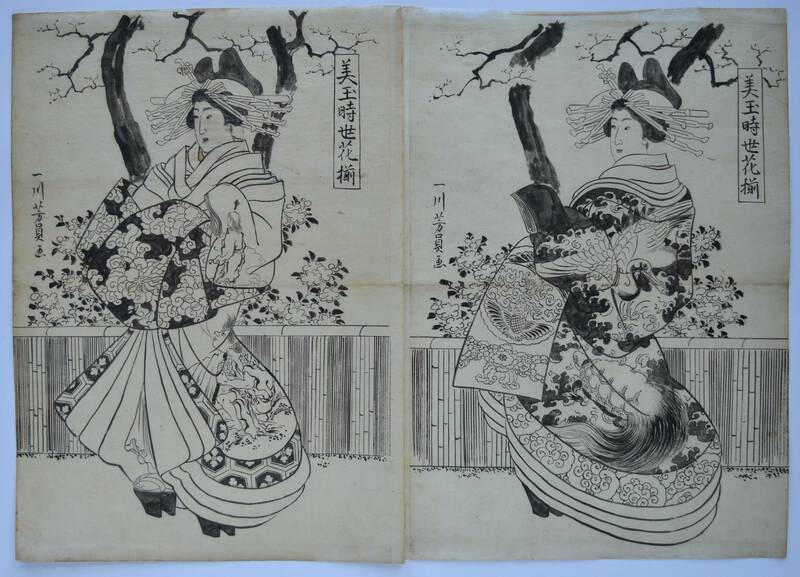 Dated at end: Meiji tsuchino-e inu, March 1898 and sealed Kiyochika no in. 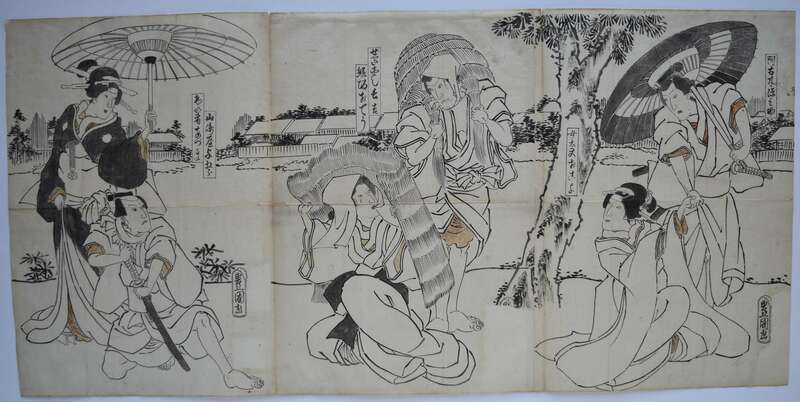 A rare complete triptych hanshita-e (original drawing for a print). Presumably never published. 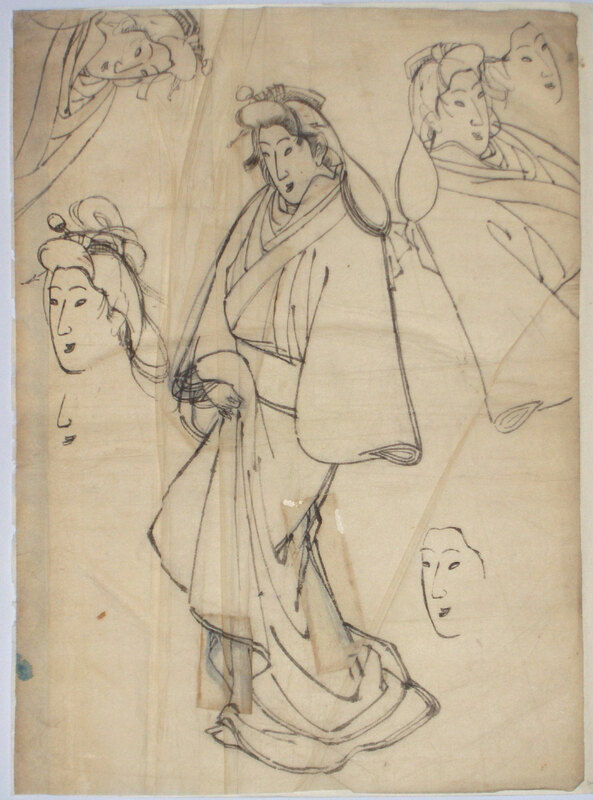 A procession at Akasaka (?). Signed Hiroshige ga on first sheet. 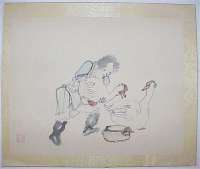 A boy feeding geese. Sumi and light colour on paper, lightly laid onto card. From an album. 27 x 34 cms; 10.6 x 13.4 inches. Good condition. Sealed Goshun no in. Hovering dragonflies. Sumi and colour on paper. 28 x 35.8 cms; 11 x 13.9 inches. Good condition. Unsigned but from a fully signed album. 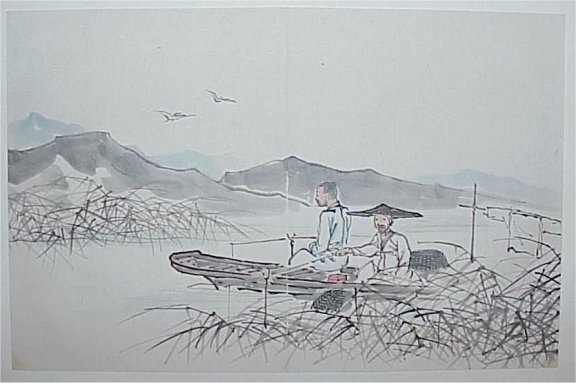 Two fishermen in a punt. Sumi and light colour on paper. 19 x 30 cms; 7.5 x 11.9 inches. A fan painting showing a children’s toy. A rotating lantern with moving images. 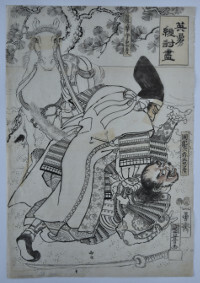 Kiitsu was a pupil of Hoitsu. Sumi and colour on lacquered paper. Good condition for a used fan. 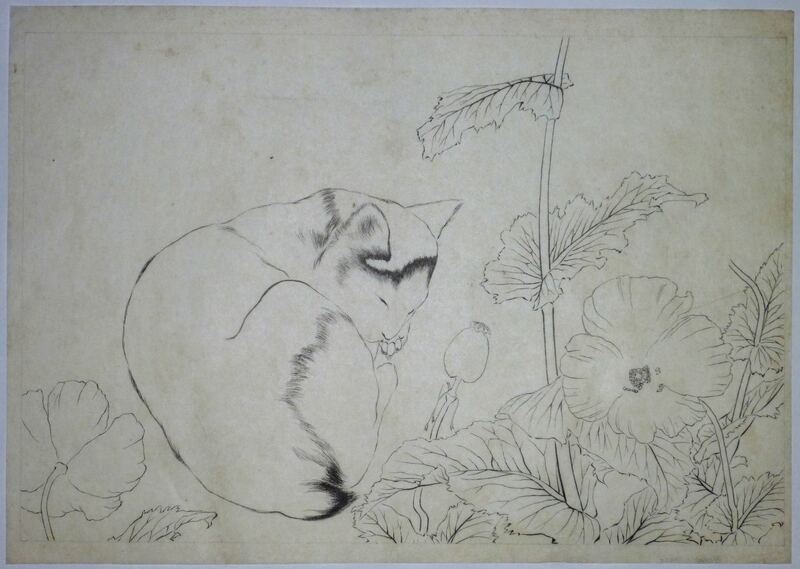 Signed Kiitsu ga.
An original drawing of a sleeping cat. 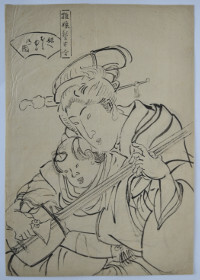 The original hanshita-e for a published print from Ten Sketches, volume two, published 1918-20. Illustrated in Hashiguchi Goyo, 130 Years Birth. 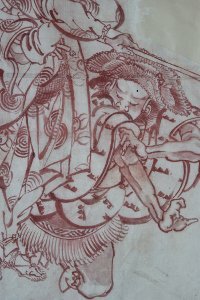 Memorial Exhibition catalogue, Chiba City Museum, Iwakiri Shinichiro, Tokyo Shinibun, 2011. 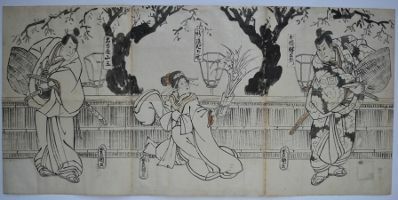 On thin Japanese paper, 11 x 15.5 in; 28 x 39.4 cms. Several expertly repaired tears, otherwise very good condition.